scratch paper. After finishing their scratch art, the students were given their own sketchbook. The students found images from magazines and used mod-podge to decorate the cover of their sketchbook and make it their own. The students used these sketchbooks throughout the semester to plan projects and to create artwork. demonstrated their knowledge of warm and cool colors to portray certain feelings – for example warm for happy and excited or cool colors for calm or sad. The objectives for this lesson were in accordance with Colorado State Standards for Art Education. the scenery for their story. 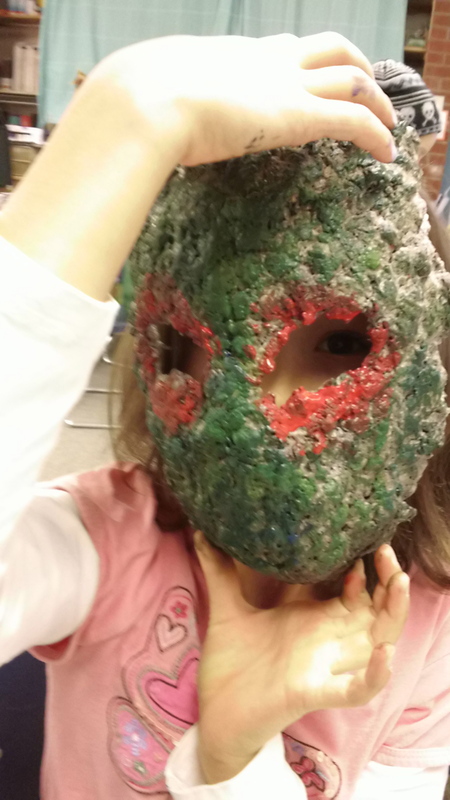 In the following classes, the students chose a character to portray and made masks out of paper mash, which they added acrylic paints and found materials. Once the masks were finished, the students acted out their story using the scenery paintings and their masks. 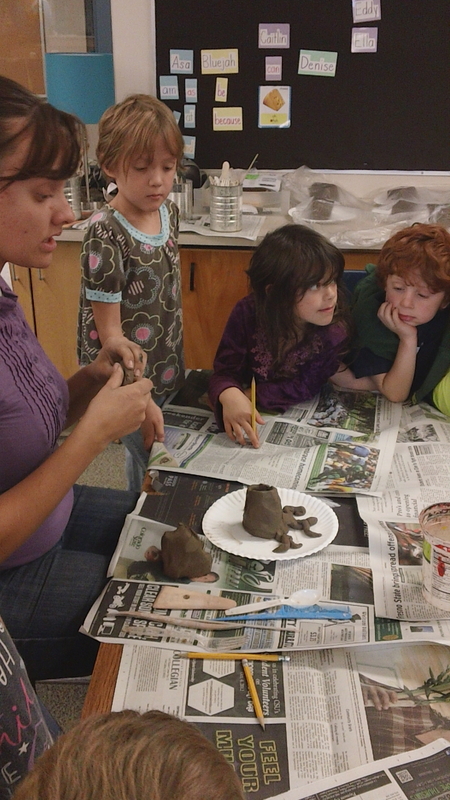 It was important throughout the lesson to incorporate literacy as well as encourage the students to observe, reflect, create, and transfer with the information we taught – the four overall standards for Colorado in Art Education. over the castle. The animals were nice. And when the tornado stopped it filled with whoopee cushions. Then it was winter and all of the animals came to hibernate. One of the animals was in outer space and they were sucked up. Then a fairy made it spring again. And the animals stepped on the whoopee cushions. 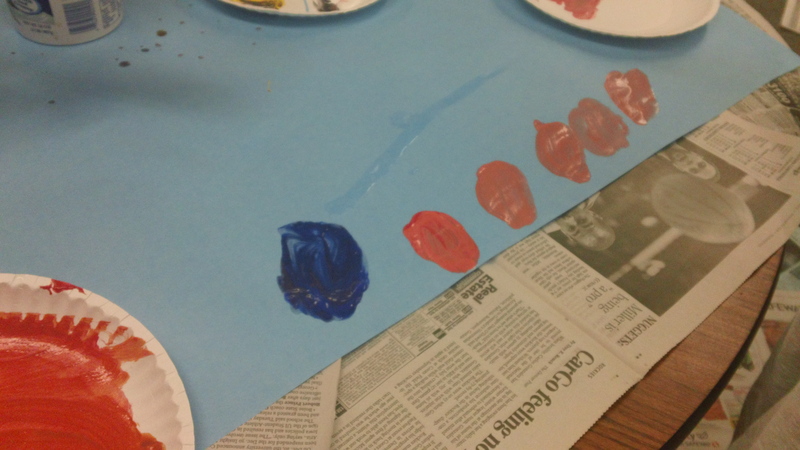 color mixing to create these works. 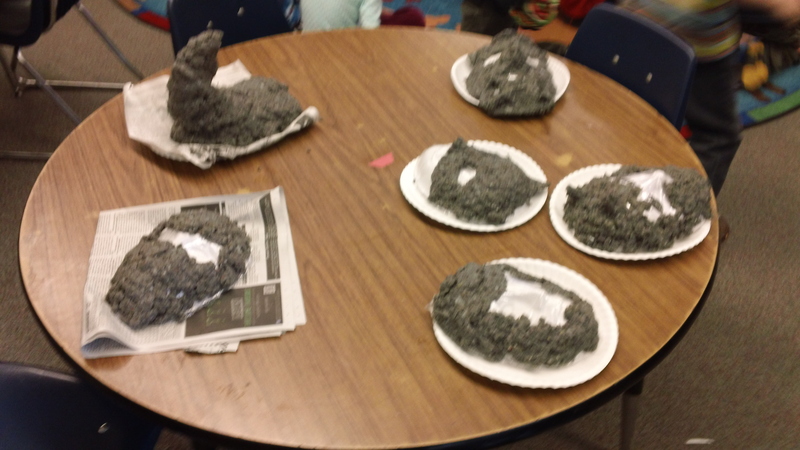 · Critical Thinking and Problem-Solving – Students were able to troubleshoot and plan how to create a scenery for their clay tree to be surrounded. This week, the students started a new unit all about trees! 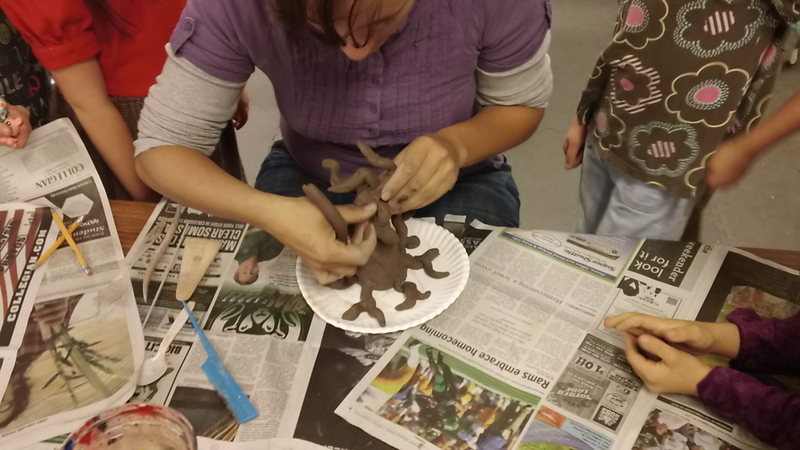 The students have been learning about trees throughout Denise’s class and this week they created their very own tree out of clay. 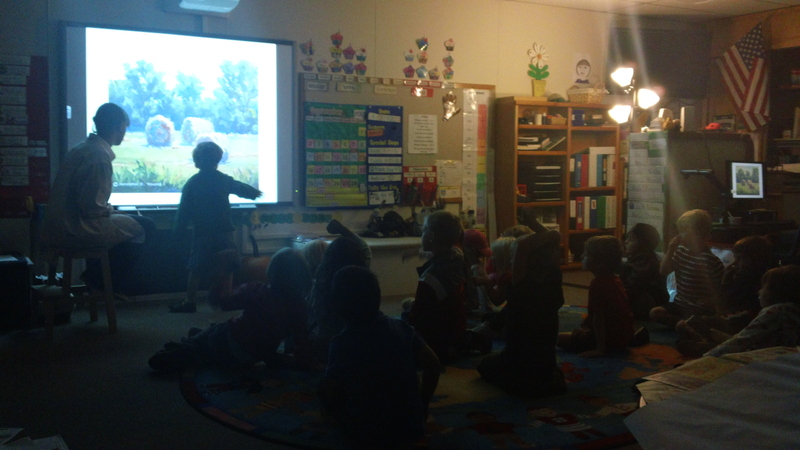 Allison began the lesson by discussing the various parts of a tree through a PowerPoint. The students knew all about trees and could discuss what they were seeing in detail. 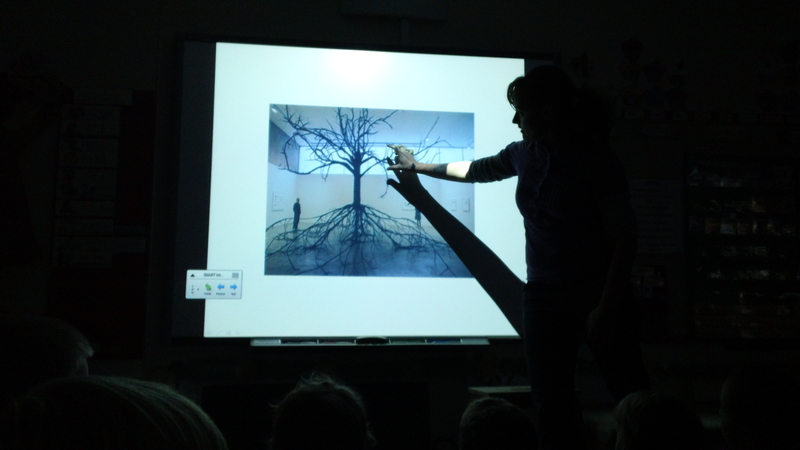 Allison showed how trees could be shown in a unique way through artwork and in a gallery. One example was a tree in a gallery with all of its roots completely visible. 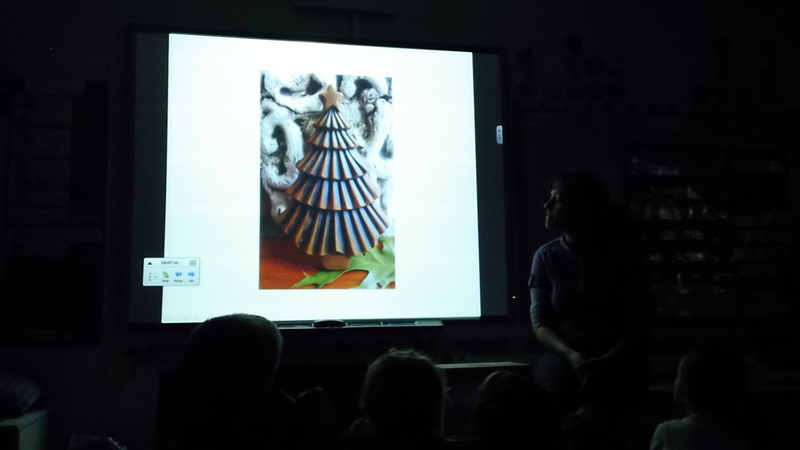 After the PowerPoint, Allison gave a demonstration of building clay tree sculptures. She made an example of a tree with wild roots and a hollow trunk. 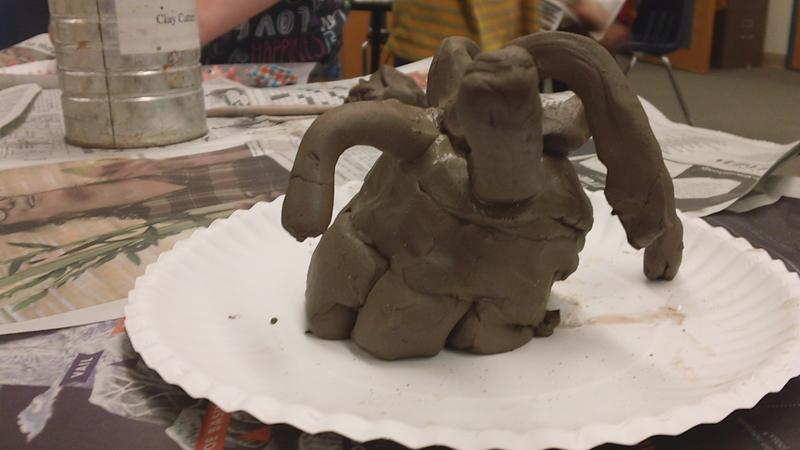 After building roots and the trunk to form a base, Allison taught the students how to slip and score – a technique in clay for adding two clay pieces by scratching and wetting both surfaces before attaching and smoothing them out. 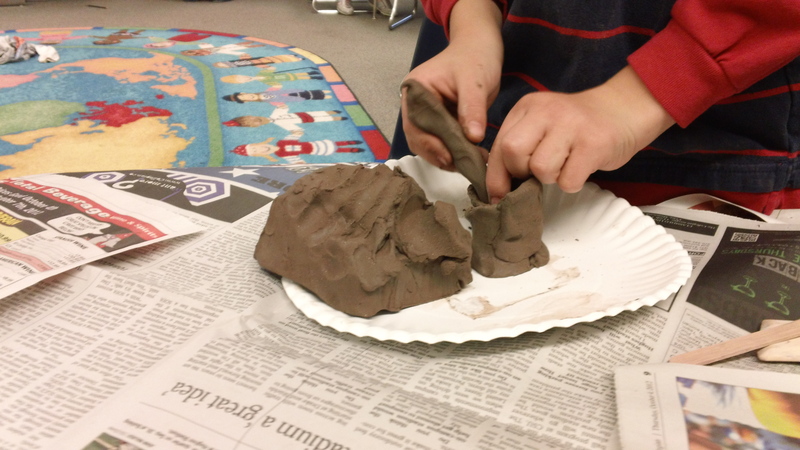 After adding many branches using the slipping and scoring method, Allison gave each student their own piece of clay to make their own tree sculptures. The students worked carefully to hollow out the inside of their trunk and many of the students’ added roots. One student discussed his tree, “It’s leaves taste like sugar but it’s good for you. 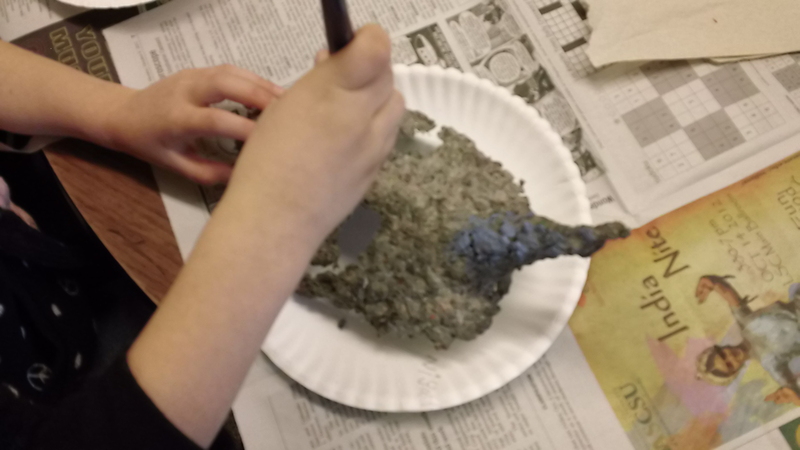 It doesn’t hurt it when you pick off its leaves.” Another student said “I’m making a tree that birdies can go into.” Soon the students had finished their sculptures with a variety of appendages. Once the students were finished it was time for them to go outside to recess. In the video below, one student shows the slipping and scoring method and how the clay felt in her hands. Allison and Mary will dry and fire the sculpture trees to make them solid in the kiln and next week they will be ready to add leaves to their trees and create dioramas for the environment surrounding the trees. For this class, the students performed a play for their classmates using the masks they had created in the weeks before! Allison gave everyone their very own ticket to the class play and each student had a numbered seat that matched their ticket. Allison set up a stage at the front of the room with curtains. 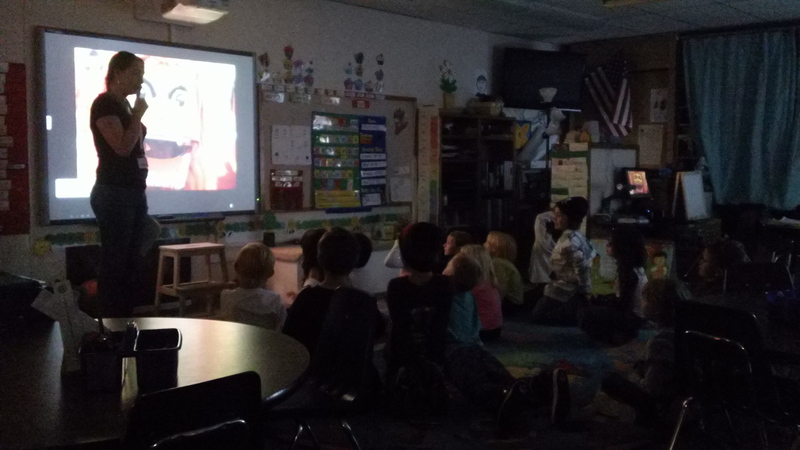 She pulled back the curtains and showed the students a wonderful example of a musical often seen on Broadway: The Lion King. 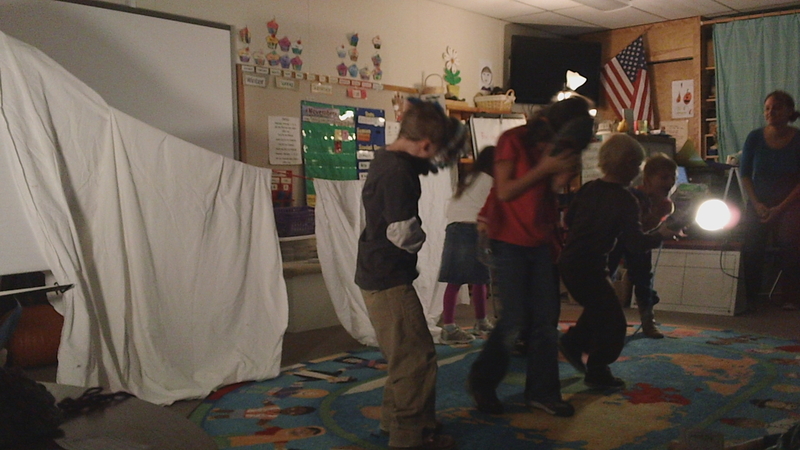 The students then practiced how they would act for various activities in the play like sleeping and floating in space. Below is a video of the students practicing some of these actions. The students then got into groups to discuss how they would wear their masks to perform their play. 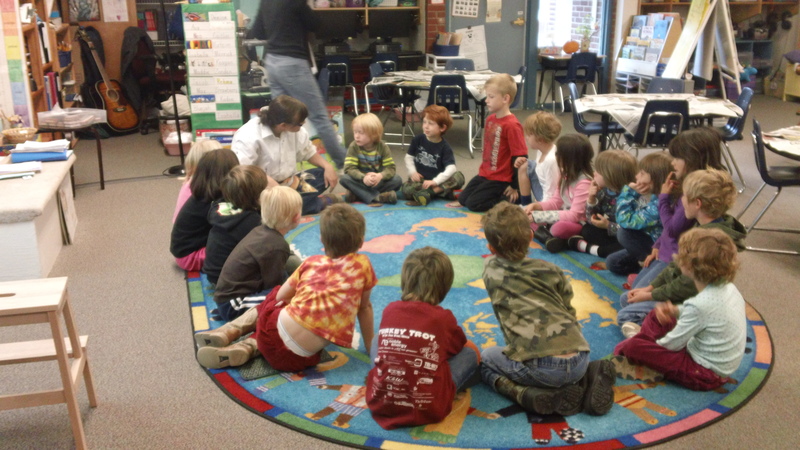 Students had an assigned part in their groups’ play ranging from ninja princesses to dragons to forest animals. One student was also the tornado that “stopped (in the forest) and filled with whoopee cushions”. Each group had a turn to act out their play in front of the other students wearing their amazing masks. 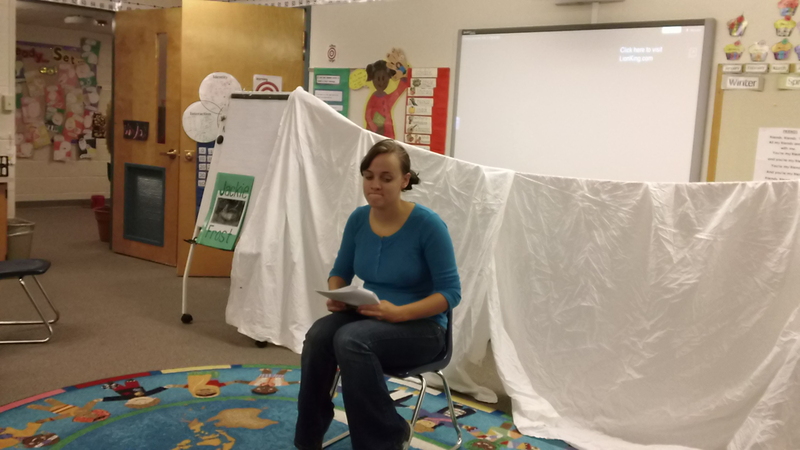 During each play, Allison hung up the background the group had created the first week when they wrote their story. After all three groups finished their play, Allison had the students discuss as a class what went well and what they could improve. 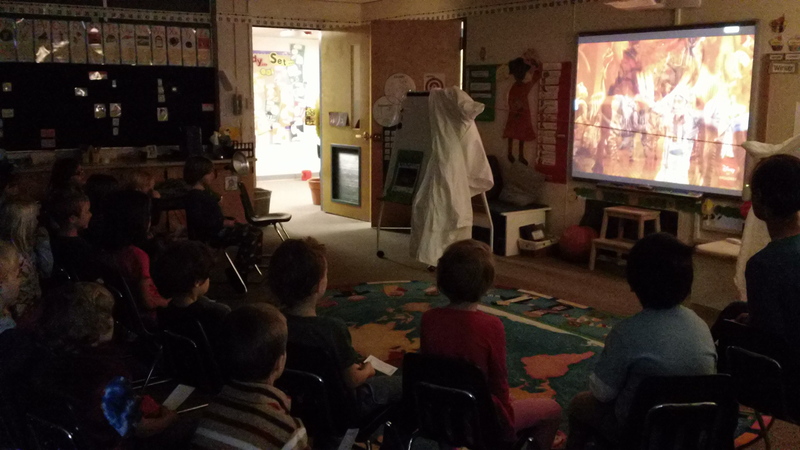 The play was a great way to end our mask unit and the students had a great time wearing their masks and entering through the curtains of the stage. Below are videos of each of the groups. Next we will begin a brand new unit about trees and the environment! Mask Embellishments: The Art of Hot Glue guns!! If you would like to get a student excited about gluing anything just give them low temperature hot glue guns and watch them go! Ms. Mary talking about the texture on the mask and how the mask makes you feel. All of the kids crowed around the table to see the hot glue demo. Then the kids in the back came to the front to see. choose and explaining the reason why she choose it, because for her cat mask it was a good color, black and because it was soft, just like a cat. All of the kids wanted to feel it before they moved on. At that point the kids started to work on their masks, gluing all the things that they like onto it. Many came up with inventive ways to use the materials to represent different things. A student talking about their mask and why they chose the material that they did. 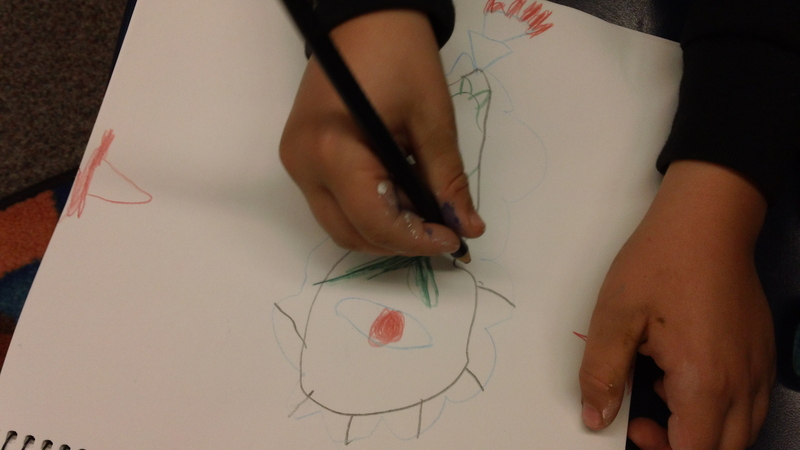 A student talking about their mask and tell what it is…the Dragon who can See and Smell everything! Student hot gluing a pipe cleaner on as a jewel. This is a student’s finished mask who decided to add little embellishment. Not all of the students made paper mash masks, one of our students made a paper mask, when asked how he made it he said “I folded it.” After which he glued on beads for the nose and cut holes out of the middle for eyes. The students worked hard on their masks and when they were done the all wanted to put them on. We had 18 masked children in the room having a great time! Look in next week because we will be doing our group plays with masks and background landscapes! 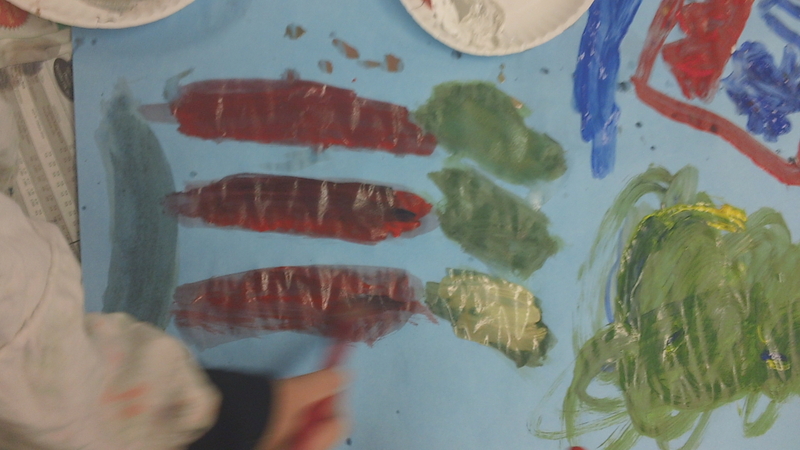 Here, a student carefully paints her Unicorn-Pegasus with a color she mixed herself. 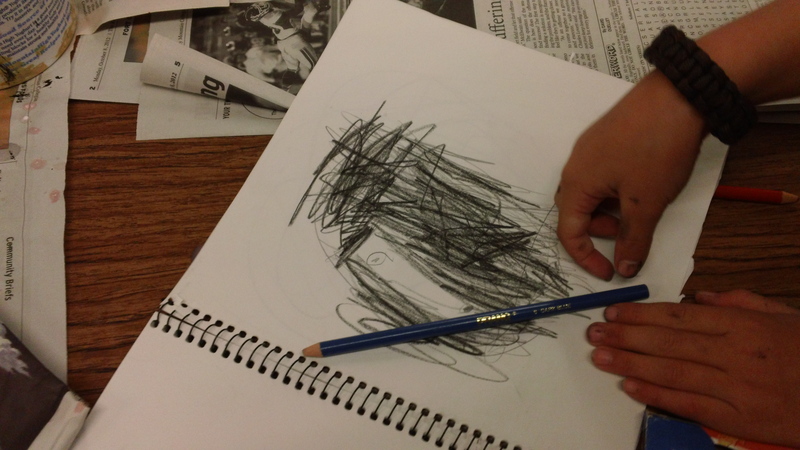 Once the students had finished painting their masks, the students took out their sketchbooks. Mary handed out colored pencils and had the students draw their mask with any items they wanted to add to their mask the next time class met. 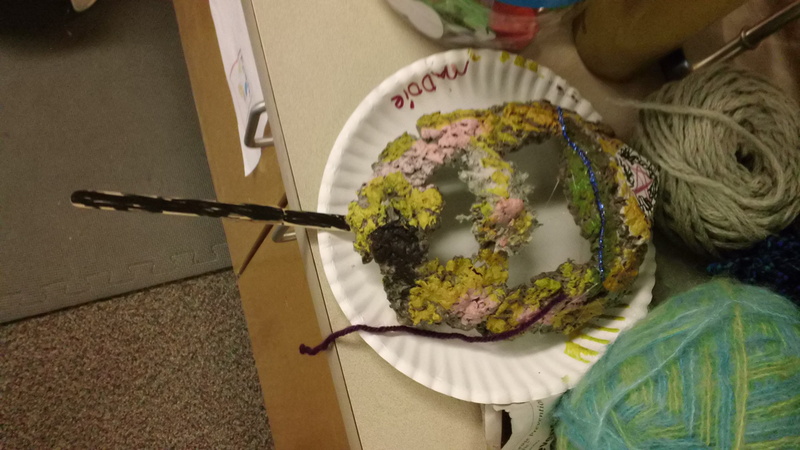 A student draws yarn and other items he would like to add to his mask. The students also thought about how they were going to hold the mask. 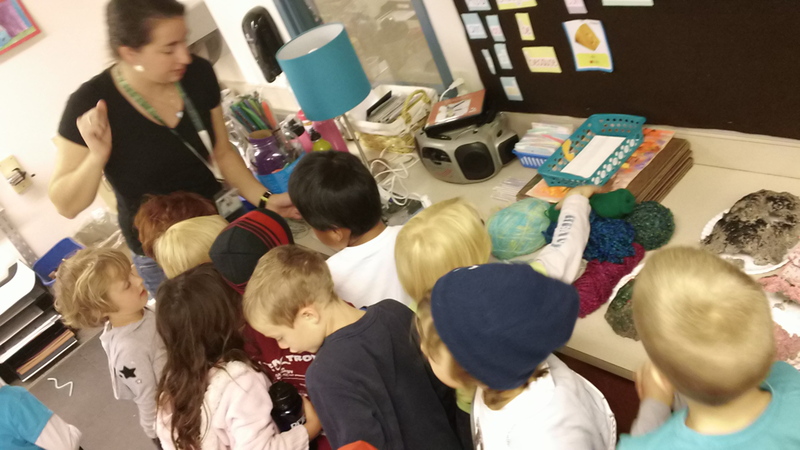 When the students were finished with this, they gathered around the oval and helped Mary make a list of all the items she should bring for the next class. This student plans on using yarn for texture on his ninja. In the video below, a student describes in detail all the items she plans to add to her mask. Time flew by and it was already time to clean up. After clean up, Mary had the students bring their painted masks to the counter and the students discussed the techniques they had used to build and paint their masks. Stay tuned because the masks should be finished at the end of next class! On Friday, Allison began the lesson by going over the story from the previous week with the students. They discussed the characters they had created and how those characters might feel. Then, Allison gathered the students in a circle and showed them a variety of masks and how masks can be used to show emotion. After discussing emotions in masks, Allison had the groups decide who would be what character in the story they had created. Some of the characters included the dragon, the ninja spy princess, various animals from the forest including a bear, tiger, cat – just to name a few. 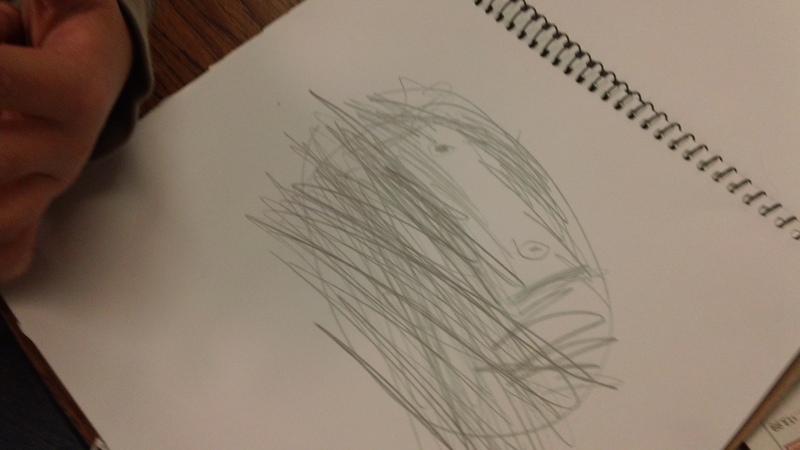 Here, a student draws a ninja! 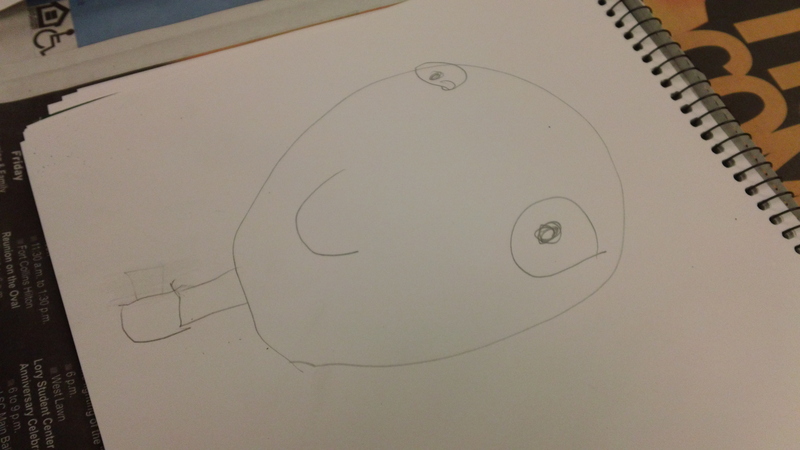 The students drew sketches of the characters they chose in their sketchbook. This student shows that he will be attaching a popsicle stick to help hold his mask in front of his face. Many of the sketches included ideas about whether they will hold their mask or be able to wear it with a strap. The students watch around the demonstration table as Allison presses paper mash onto the mask form. 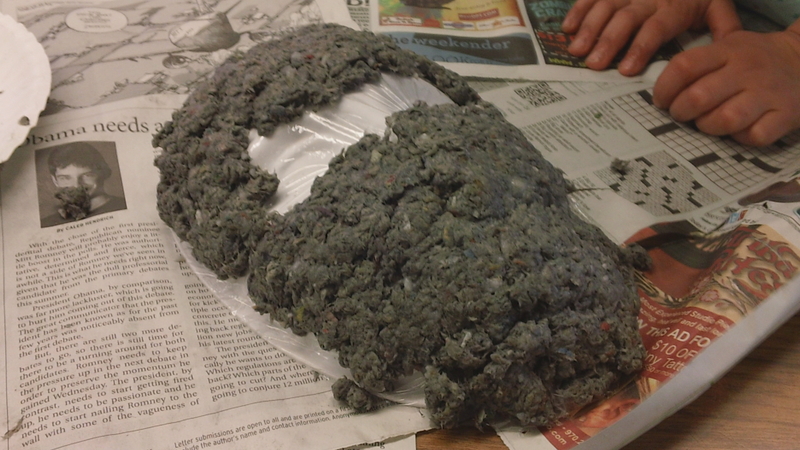 Allison then showed the class how to use a new material – paper mash! The students put the paper mash over premade mask forms. At first, some of the students were getting used to the new material. One student said, “The stuff we used to make the mask is really slimy and wet! 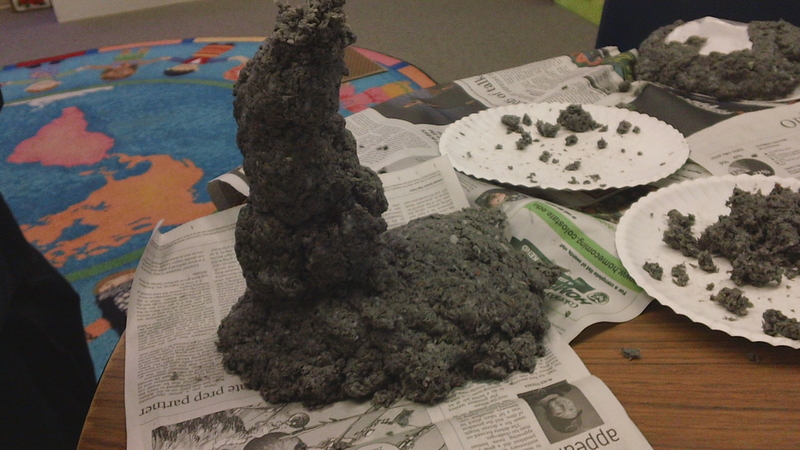 And it kinda looks gross!” But by the end of the lesson they were all having a great time. The students began to build up the mash for unique facial features. You can see this in the student’s work below. Here are some examples of the masks at the end of this class session. Next week the students will paint and plan out their other embellishments for the masks! 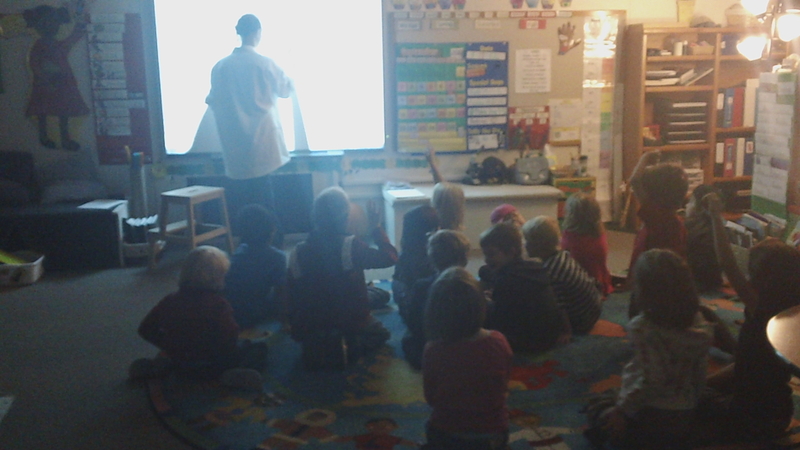 Allison carefully writes out the story on the smart board as the students tell her each sentence. 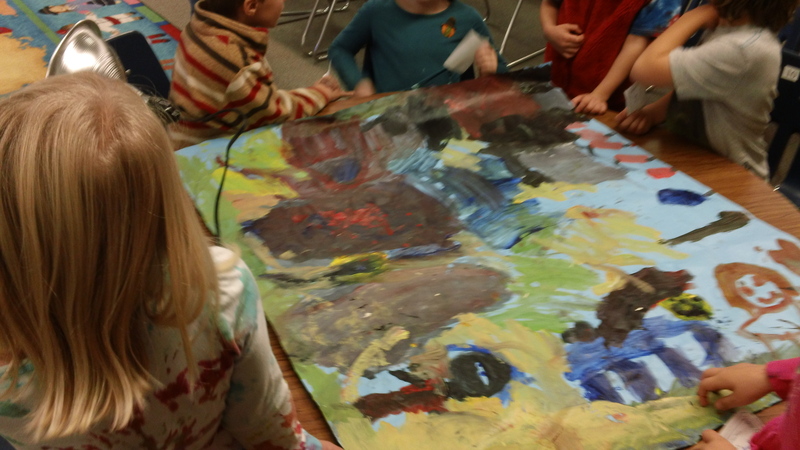 After the students created their story, Allison gave a brief demonstration of landscapes. The students seemed to know what the foreground, middle ground, and background were right away and could point them out on various landscape paintings as we see below. Here, a student points out the foreground of the painting on display. After the slide show, Allison put the students into three groups to collaborate on a landscape painting for the background of the story. The students went to work right away and were very excited. The groups each chose a different way to display the scenery to go with the story they had come up with as a class. Here, students work on the space scenery. Here the students are beginning a space scene according to their story. 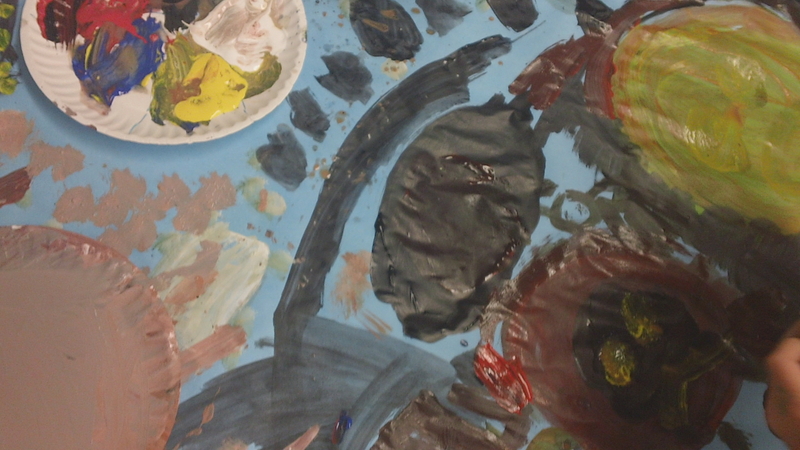 The students added many planets, including Saturn with its rings. One student works on other planets including Earth. Here, we see a more finished Saturn on the left and the space tornado on the right. One student commented, “The tornado is in space too!” We can see Saturn with its rings in the photo above as well as the space tornado. Here, students are working on the land and grass in their scenery. A student carefully creates the foreground. 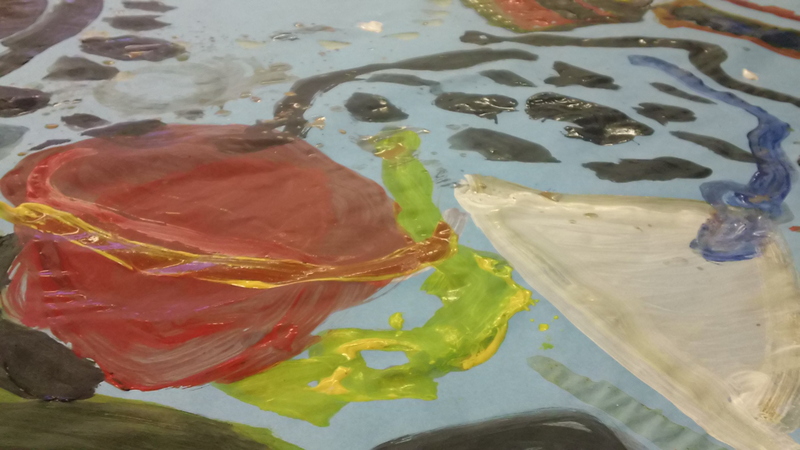 The students worked very hard on their scenery, and many students focused on one aspect of the scenery that was meaningful to them personally. In the photo above, a student focuses on the whoopee cushions. 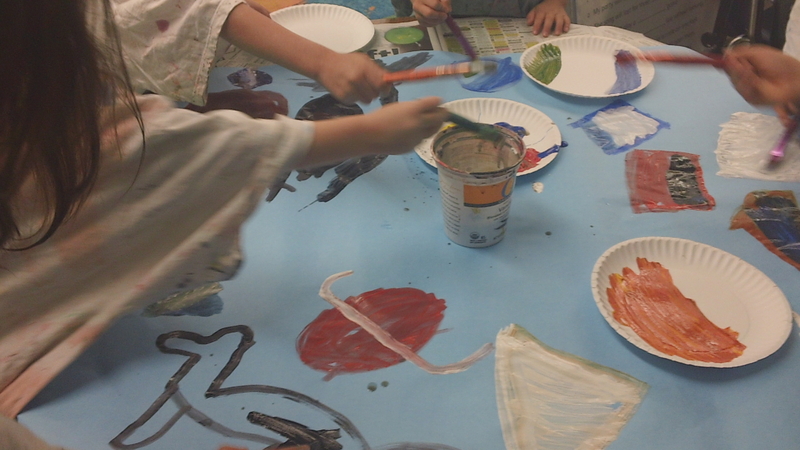 When the groups had finished their paintings, Allison guided the class to each painting table around the room to discuss each groups work talking about what they liked and what they would have done differently. 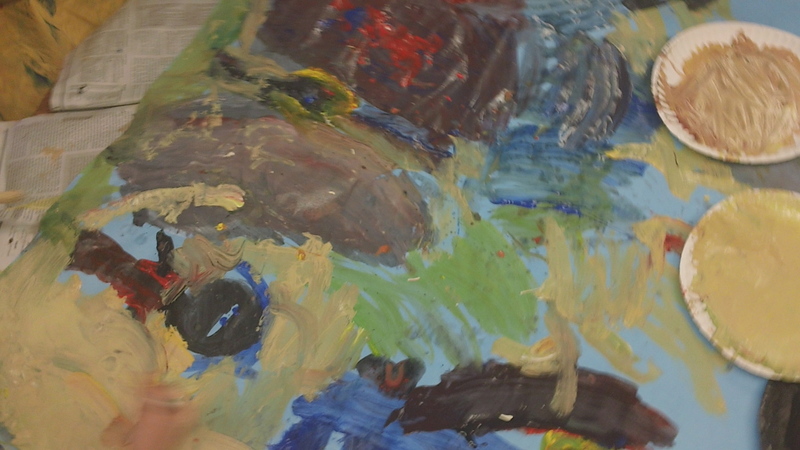 The video below shows the class critiquing one group’s painting. Before we knew it, the time had come to clean up. The students learned a lot about collaborating this week and did a great job working with one another. Next week the students will get to focus on the characters for their story!